Built for MOZA Air, the quick release baseplate is fully compatible with Manfrotto 501PL and Arca Swiss quick release plate. It allows you to detach your mounted camera from the MOZA Air and easily attach it to other photography devices. The MOZA Air features the same advanced technology and high-quality materials as the MOZA Lite 2, but with an enhanced appearance and improved stabilization performance. Made from aerospace industry-grade aluminum, it weighs just 2.4 lbs (1.1 kgs). The sleek, unified design with no exposed wires, compact structure, solid aluminum construction, and powerful, automobile-grade motors with high resolution encoders make it the most reliable camera gimbal in the industry. your camera and gimbal, simply by operating the handgrip. You can turn your power on or off, switch modes, control the direction of the gimbal, and start or stop recording. 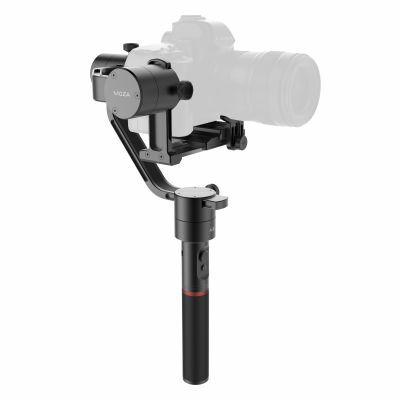 The included dual handle makes the MOZA Air not just a single handheld gimbal. No matter high perspective or low angle shots, lightweight mirrorless camera or a little heavier DSLR, the MOZA Air can adapt to your specific shooting scenario with two handheld modes. Your handheld shooting experience is better than ever! The handgrip houses three lithium batteries with 2000mAh capacity that can run over 12 hours.